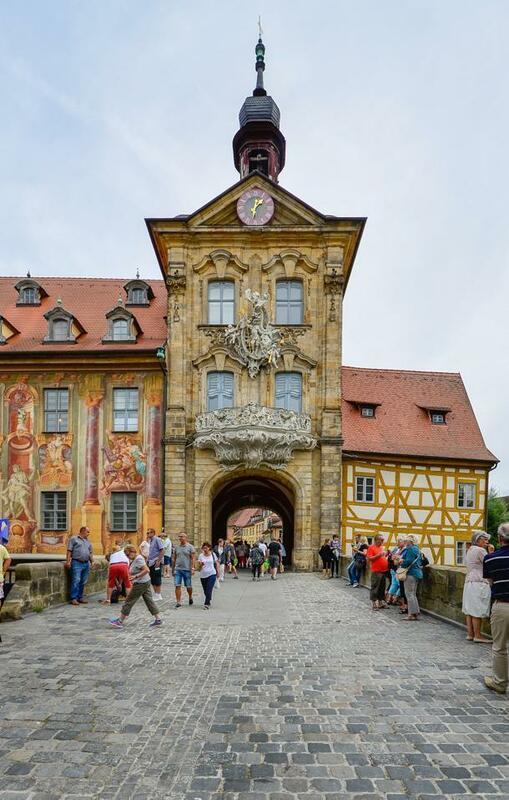 Adi takes us on a family-friendly weekend getaway in UNESCO-listed Bamberg, Germany. Living in Germany comes with a lot of perks. The most important one for me is the travel opportunities. 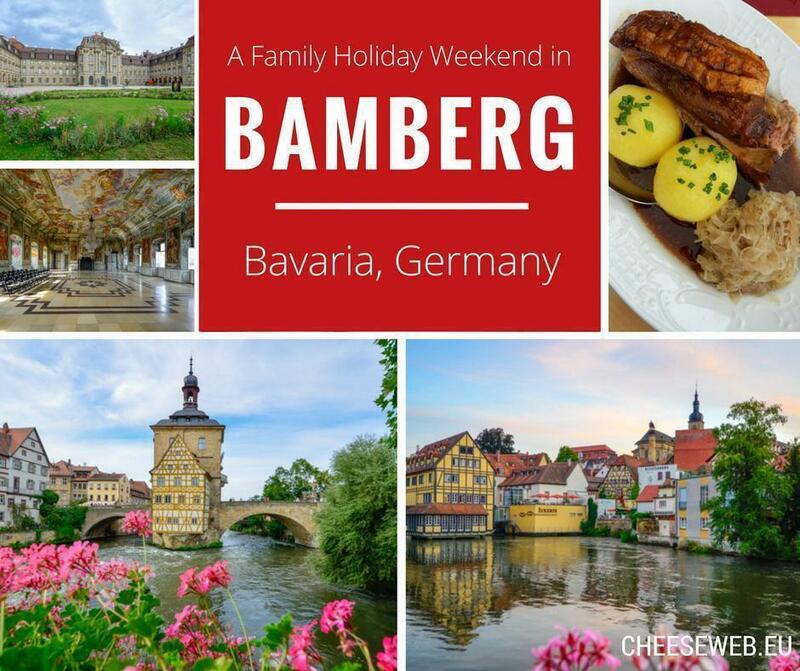 A few weekends ago, we were able to fulfil our family travel wish of visiting Bamberg, Germany. 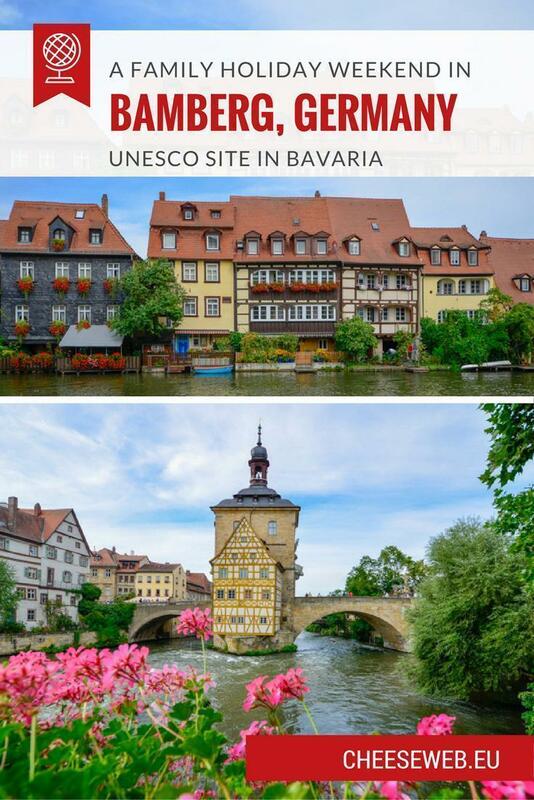 Perusing the different booking websites, I was depressed realising just how expensive staying in a hotel in Bamberg can be. Even Airbnb, my most trusted source of excellent accommodations, let me down. 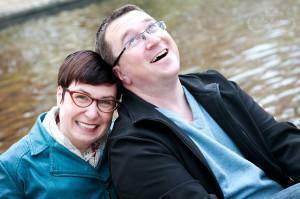 We almost gave up the thought of going to Bamberg. But hubby had the idea to look up brewery stays. As it turns out, many of the breweries offer rooms and breakfast. We quickly discovered Fässla Brewery, which offered double rooms for 70 euros/night, a bargain when considering my earlier search results. Because we are budget travellers and consider lodging the least important part of our travels, we chose a double room, with one double bed, and brought two sleeping bags with us. I realise that this practice is not mainstream, but it’s worth considering as an option to keep costs low. Typically, a family room runs from 150-300 euro/night. 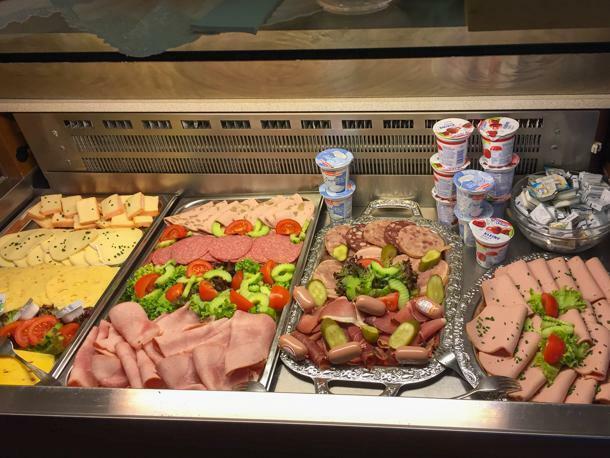 The continental breakfast at Fässla allowed us to start the day with bellies full of German goodies. The brewery opens early, and many of the locals prefer a liquid breakfast. If that is what you wish, that is what you shall have, as nobody around is squeamish about beginning the day with a tall glass of Bamberger goodness. 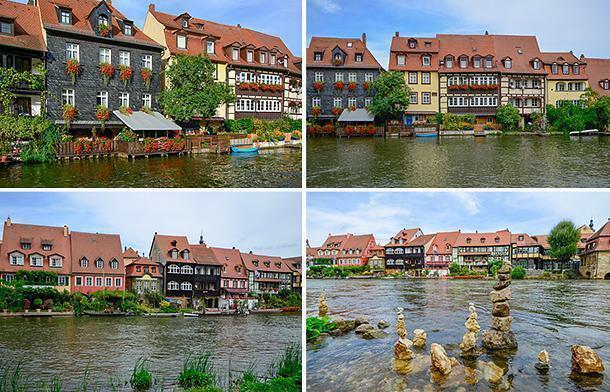 For a little town, Bamberg has a lot to offer to its visitors. 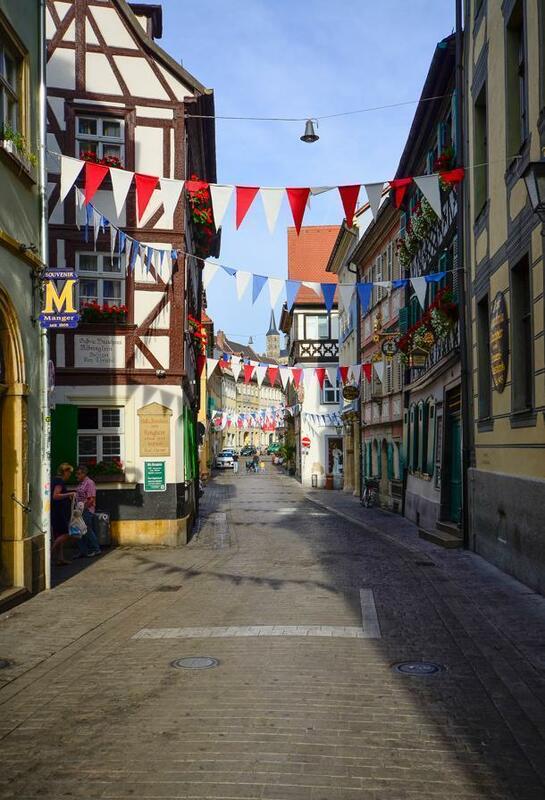 During WWII, Bamberg was not a major base for the Nazis, and no weapons were produced here. Thus, it escaped the catastrophic treatment that befell cities like Nürnberg and Dresden and features some of the oldest buildings in Germany. 1. Bamberg Cathedral, also known as the Bamberger Dom St. Peter und St. Georg, was finished in the 13th century and is the burial place of Emperor Heinrich II, the founder of the cathedral, and his wife, Empress Kunigunde. Here you will also find the tomb of Pope Clement II, the only Pope buried in Germany. We arrived at the cathedral early in the morning, the best time to visit to enjoy the space in peace and quiet, before tour groups take over. The cathedral is about 94m long, 28m wide, 26m high, and the four towers are each about 81m high. Inside there are many works of art including the Bamberg Horseman. The subject’s identity is not known, but historians suspect it could be the Hungarian King Stephen I. If travelling with kids, get the free booklet made just for them, at the stand inside the church, to keep them occupied with discovering and learning about the different works of art. Bamberg’s Old Town Hall on its man-made island. 2. The Old Town Hall was built on an artificial island because, as the legend goes, the Bishop of Bamberg did not grant his people any land on which to build it. So the townspeople started putting stakes in the Regnitz River to create the island and build the town hall they so badly wanted. Frescoes adorn each side of the town hall. The artist used the trompe l’oeil style giving the artwork three-dimensional qualities. One element, in particular, stands out; a cherub leg protrudes out of the wall as a sculpture. I could have spent hours just in this area. Many other travellers had the same idea. Judging by the number of tourists around, this is the main attraction in Bamberg. 3. 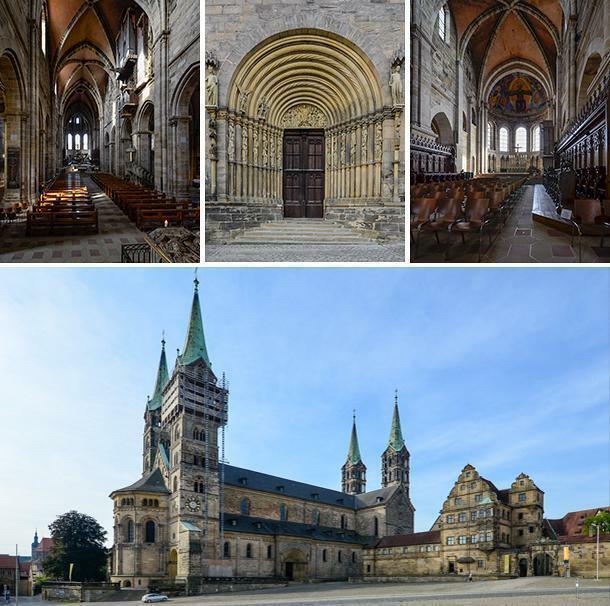 Michaelskirche Monastery, a former Benedictine monastery, is sadly closed to the public. Not too long ago, parts of the ceiling collapsed. 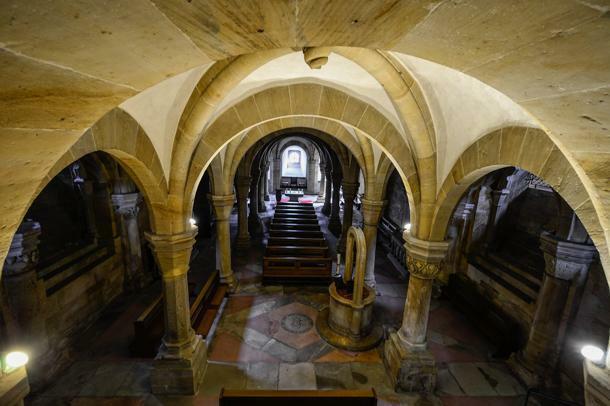 It is being restored and is set to reopen in 2021, at the earliest. But don’t let this little detail keep you from visiting the grounds of the church. Because it’s on a hill, the views of Bamberg are splendid. 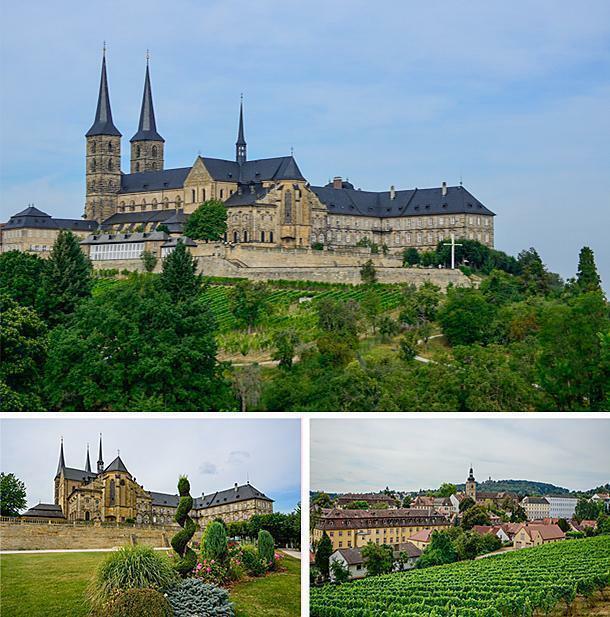 At the restaurant present on the monastery grounds, you can enjoy a glass of gorgeous Franconian wine, made from grapes from the monastery’s vineyard. 4. 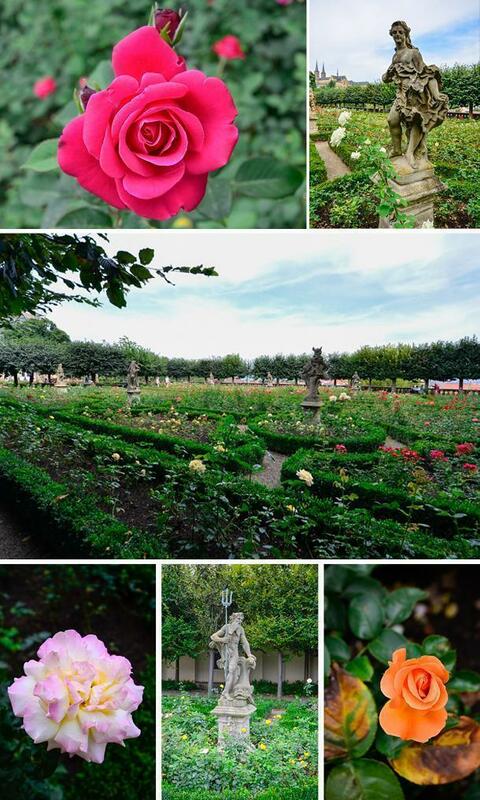 Neue Residenz and Rosen Garden. The New Residence was once the home to the prince-bishops and displays a series of lavish rooms that portray the prince-bishop’s Lothar Franz von Schönborn lifestyle. 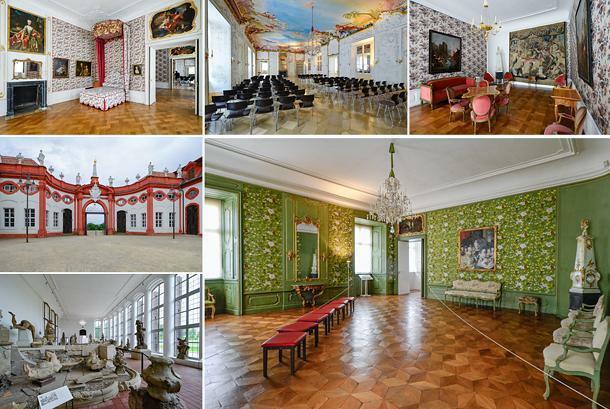 The New Residence showcases antique furniture, numerous 17th and 18th-century rugs, the stucco work, and a collection of old German and Baroque paintings belonging to the Bavarian State and the city of Bamberg. The highlight is, without a doubt, the Imperial Hall, painted by Melchior Steidl. The residence cannot be visited without a guide, included in the price of the ticket. If you arrive early, you will most likely be alone with the guide, as in our case. 5. 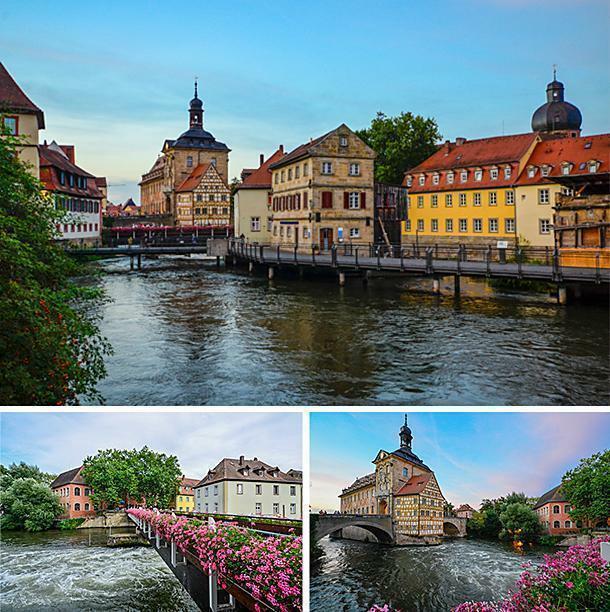 Little Venice is a term of endearment given to the former fishermen’s district in Bamberg’s Island City. This area is filled with half-timbered buildings, built mainly in the Middle Ages, propping each other up along the riverbank, and surrounded by little gardens. The river cruise takes you directly past this unique line of houses, or you can walk on the other side of the river and take your time observing them. There is also an area designated for sitting, or you can simply sit on the grass. 6. The Green Market was one of my favourite places to visit. The market arouses the senses, with fresh produce and flowers that draw you near with their smell and colour. Located in front of St. Martin Church, the Green Market is just that, a place where you will find a vast offering of fruit, veg, and flowers. We stopped to buy raspberries, the perfect snack when travelling with kids. The market is open every day except Sunday. 7. 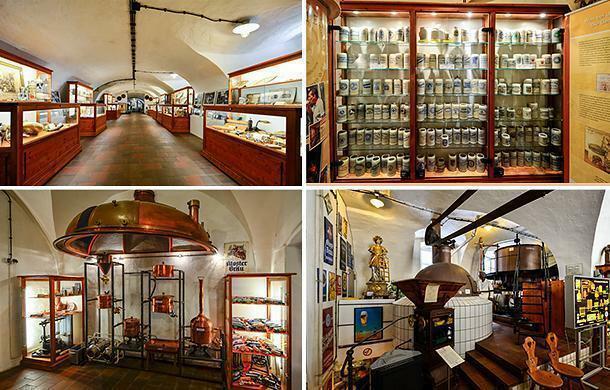 The Franconian Brewery Museum is one of the main attractions for beer lovers and connoisseurs, such as my husband. His one wish while in Bamberg was to visit this museum. Built in the magnificent vaults of the former Benedictine monastery, the brewery museum is a fascinating journey through the history of beer. The museum stretches over 900m2 and displays more than 1300 pieces in its collection. Once inside, you are transported to different points in time to observe the different ways people brewed beer with the available technology. 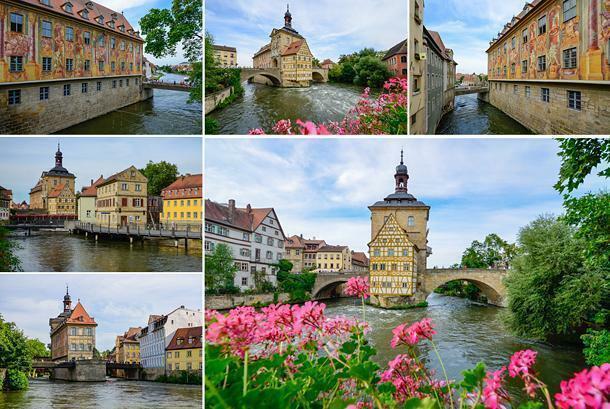 Take a boat tour on Bamberg’s river for a different perspective. 8. 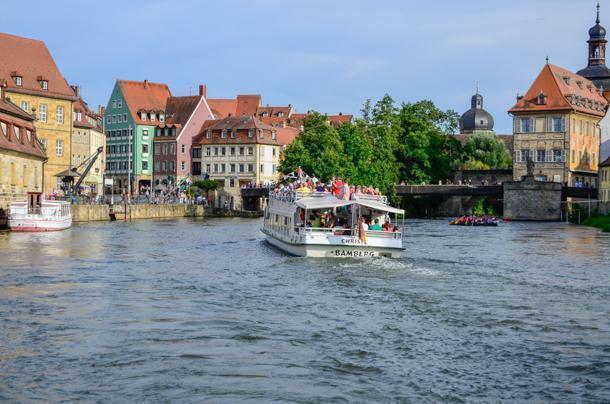 River tours are available during the day for 25-minute rides, leaving the Bamberg harbour and passing Little Venice. The cruise allows you to view the pretty houses from the water. While onboard you can order refreshments. On a hot day, a cold beer and the pleasant river views are worth the five-euro ticket. 9. Gondola rides are also available if sharing the larger boat is not your cup of tea. There is only one gondola, as far as I could tell, and the ticket is fifteen euro/person. 10. St Martin Church was a short walk from our brewery hotel. It shares the same square as the Green Market. 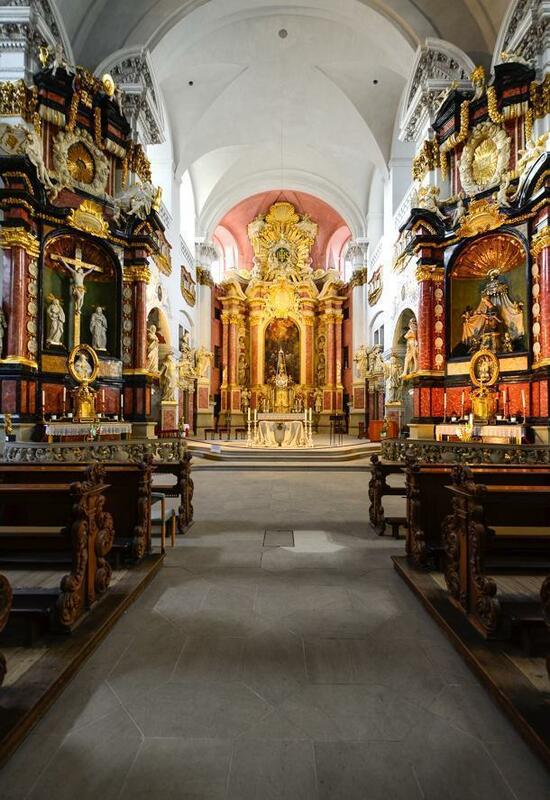 St Martin is the only Baroque church in Bamberg. At the moment, it is undergoing major restoration and, sadly, the impressive façade is covered in scaffolding. The same is happening inside; the back side of the church is also covered. The front half, however, is well worth going inside to view. The dome, painted by Giovanni Francesco Marchini, using the trompe l’oeil technique, feels three-dimensional. Due to all of the scaffolding, the church has an eerie feel, as it is quiet as a grave. 11. Seehof Palace was built in 1686 as a summer residence for the Prince-Bishop of Bamberg. After secularisation, it fell into disrepair under private ownership. Furniture was auctioned off, and by the end of the 20th-century extensive restoration work was needed. It took years to bring the original pieces of furniture back to the palace. Most of Seehof Palace is now used by the Bavarian State Conservation Office. 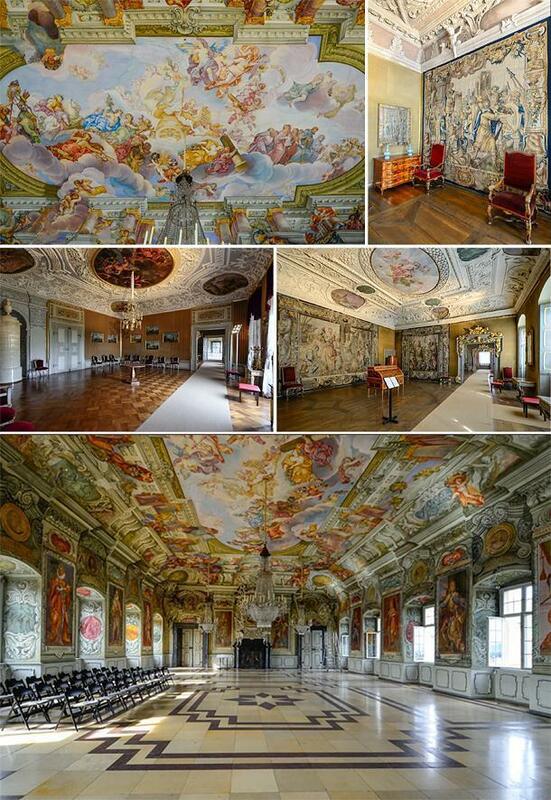 The nine staterooms of the Prince-Bishops’ apartment, are open to the public, including the ‘White Hall’ with its magnificent ceiling painted by Guiseppe Appiani. In the former Rococo garden, are the restored cascade with its waterworks, and some of the original sandstone sculpture. The cascade is only on for ten minutes at the time, every hour, on the hour. Visiting the palace is only possible with a guide, and while most of the tours are in German, there is one tour a day in English, at 11 am. 12. 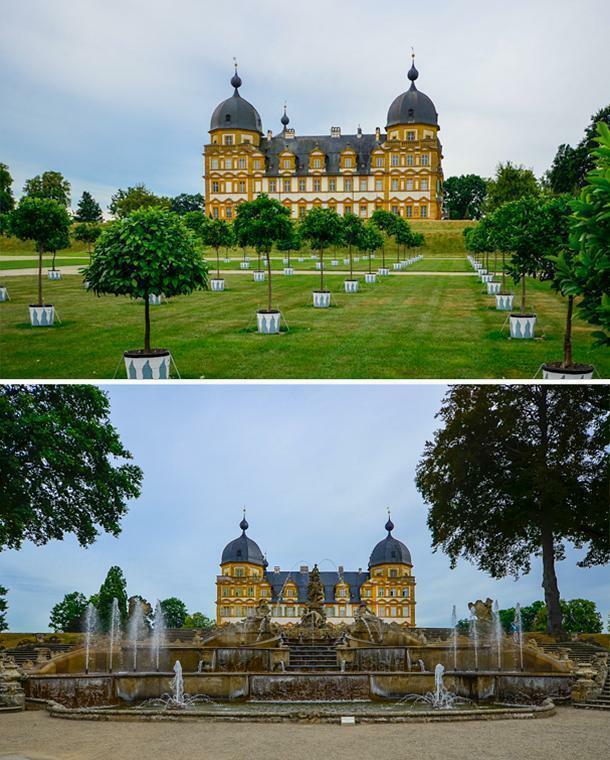 Weißenstein Palace is a pleasure palace designed forLothar Franz von Schönborn, Prince-Bishop of Bamberg, and is considered a masterpiece of Baroque art. In the palace’s private art collection are over 600 paintings by Baroque and Renaissance artists, including Peter Paul Rubens, Titian, Rembrandt, and Anthony van Dyck, many of which decorate different halls of the palace. 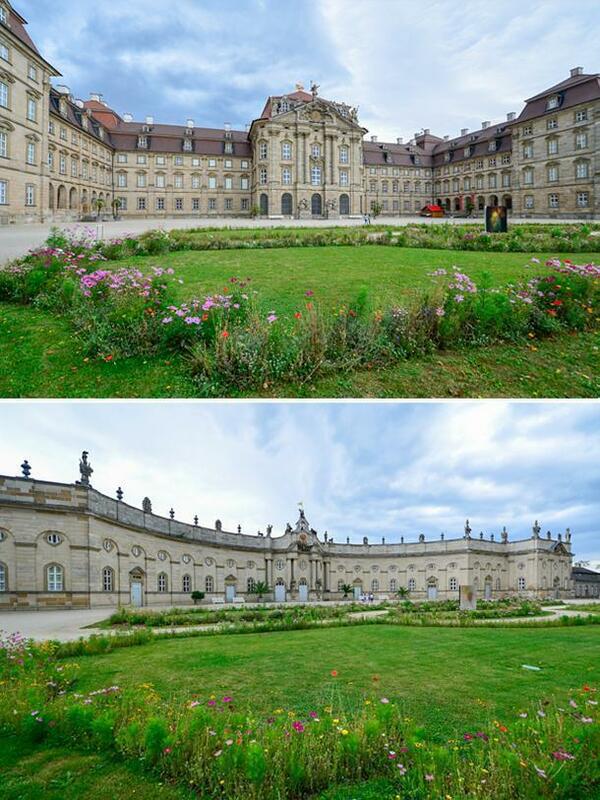 It is the largest private collection of Baroque art in Germany. Highlights of the palace include the monumental staircase, which spans three levels ending at the ceiling with a magnificent fresco; the shell grotto room, decorated with millions of shells giving it a fresh, salty seaside smell; and the beautiful marble hall, used today for a series of mini concerts. Admission is by guided tour (only in German. Sheets in English are given to help). This palace was a great source of joy and misery for me. Joy because this has to be one of the most amazing constructions I’ve ever visited, and misery because photography is not allowed inside. Food in Bamberg is affordable if you eat at breweries and pubs. 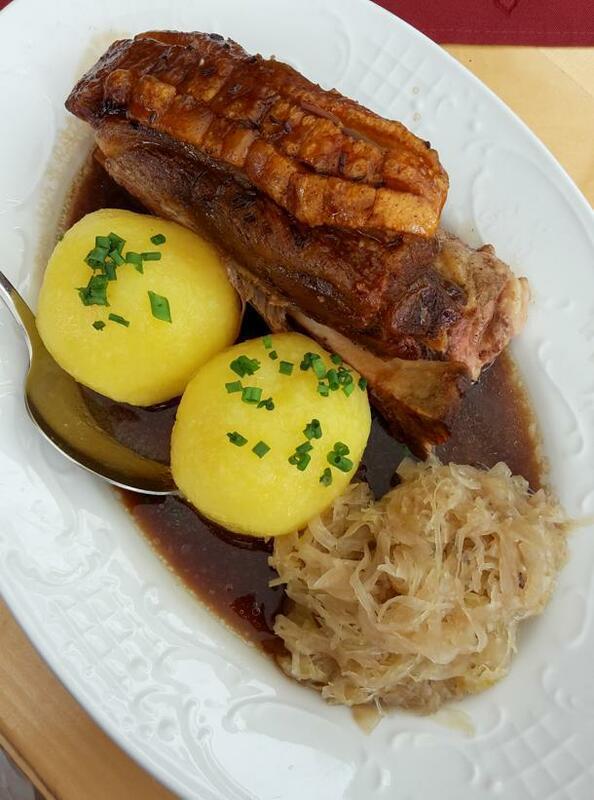 The food is traditional German, heavy on pork, potatoes and sauerkraut. However, a serving big enough to feed a small army will only cost you 8 euro or less depending on what you choose. You cannot leave Bamberg without eating a Bamberg onion and drinking a rauchbier (smoked beer) at Sclenkerla Brewery; a historic smoked beer brewery first mentioned in 1405, now run by the Trum family as the 6th generation of brewers. 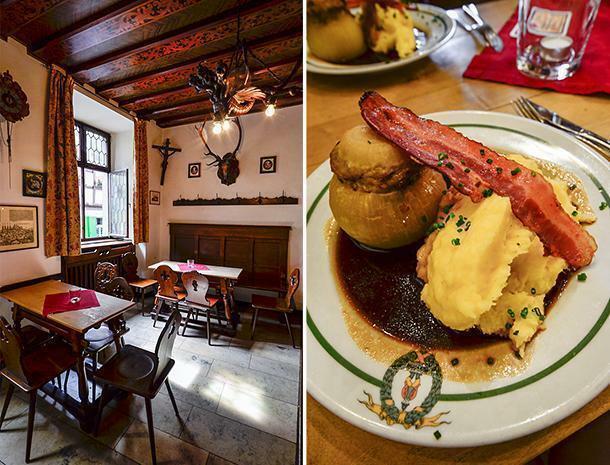 The Bamberg onion is a carved onion, filled with minced meat and cooked in the oven, served with mashed or boiled potatoes in a bath of beer sauce. 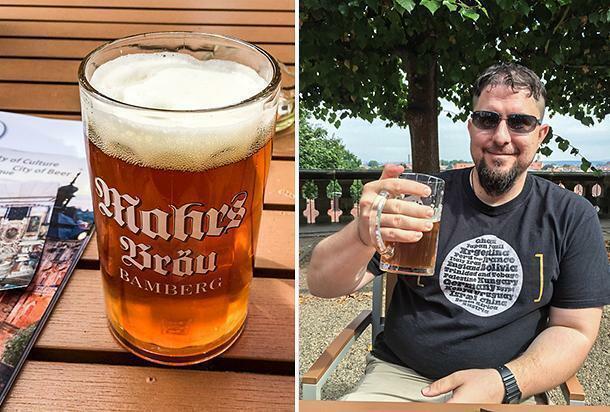 My husband, who brews beer at home, and who can tell you everything about beer, was in his personal heaven tasting his way through Bamberg. 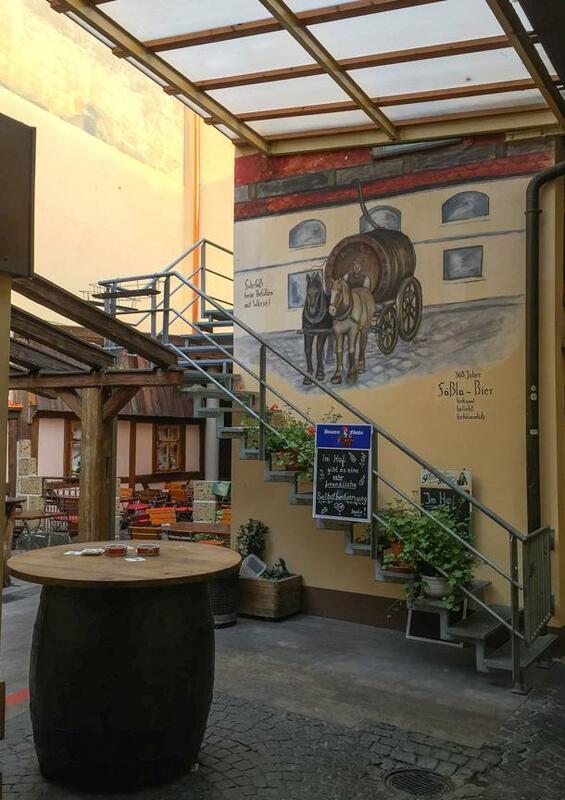 Bamberg, Bavaria is for beer lovers! Another restaurant worth mentioning was right outside Weißenstein Palace, at Hotel Dorn am Schloß. It was a cold, wet day and their menu was loaded with huge pork dishes for just a few euros. Their crunchy pork, served with potato dumplings and sauerkraut, was big enough to share, and oh so good. Carry cash at all times. We found Bamberg more cash based than card friendly, especially the breweries and even our B&B stay. I cannot remember the last time we paid cash for accommodations. To avoid the crowds, go out early; Not an easy thing for many but it’s worth the effort. Bamberg gets very crowded during the day. To see it quiet and calm visit between 7 and 9 am. It will be worth it. If you need to be connected at all times, know there isn’t much wi-fi connectivity around Bamberg. A lot of the breweries and pubs will stop offering food after 9 pm, but you do have options as the little Imbiss fast-food places are open late. 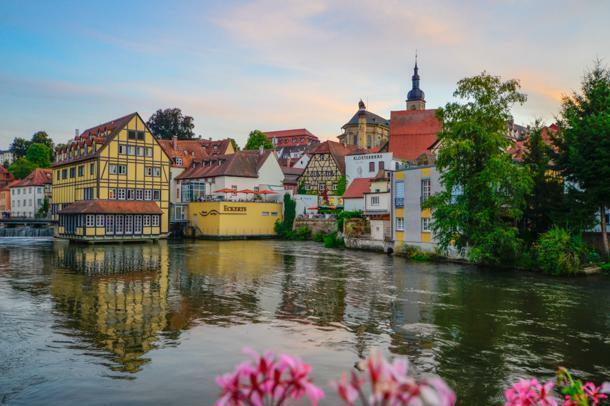 With its beautiful UNESCO-designated architecture and affordable food choices, Bamberg, Germany makes an excellent, family-friendly weekend getaway destination.